You don’t need me to tell you that snake print is HUUUUGE right now. Everyone’s wearing it. Everyone’s loving it. Including me. If you bought lots of snake print last season and are now thinking of packing it away, STOP. This print is going nowhere, and I’m hopeful that it will become a wardrobe staple rather than a trend, just like my beloved leopard print. As we are coming in to Spring, I love wearing brighter colours or pastel shades. (Colours to look out for this season are lilacs, sage greens and blues.) This is wear Topshop come in. Topshop are great at combining trends and this season is no exception. 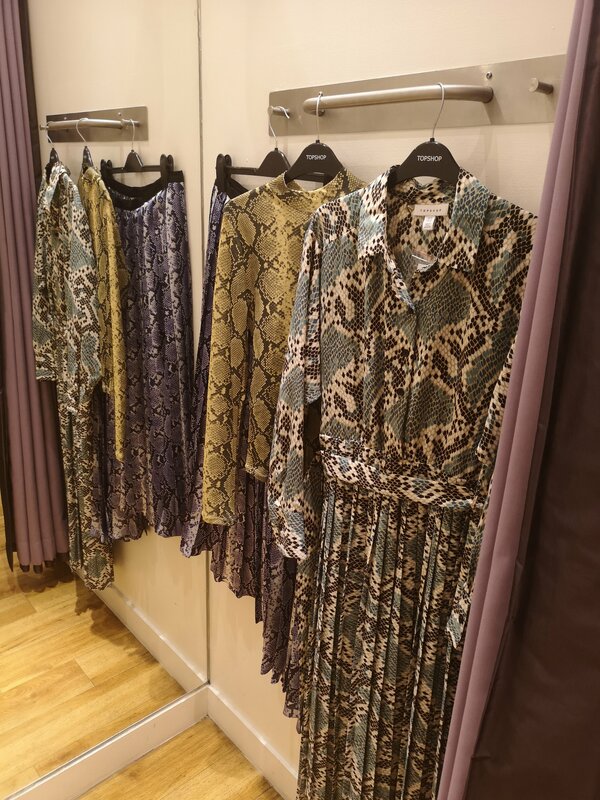 I recently visited the Foyleside Store where I found myself drawn to the colourful snake print pieces. So if you’re looking to update your snake print with a bit of colour, keep on scrolling. This dress was insta famous last year in a beige snake print, they’ve revamped it for Spring and it is absolutely stunning! The blue will look great on any skin tone and hair colour. If you aren’t keen on dresses, this print also comes in skirt and shirt form. This print was available in a top before Christmas, unfortunately I was too late in getting my hands on it, but now the skirt has arrived and I’m in love. The asymmetric hem, the lilac colour and the D Ring detail just makes this skirt the perfect addition to your Spring wardrobe. Sage green is set to hit the high street with a bang this season and at first, I wasn’t quite sure about it. After trying on this top with the wide leg (very flattering) trousers, I’m a total convert. This high neck, sheer top would also look great under dungarees or a pinafore dress. What is your take on the snake print trend?